With the nightmare that is getting to and from the airport, it should come as no surprise that air travel satisfaction is lower than ever. 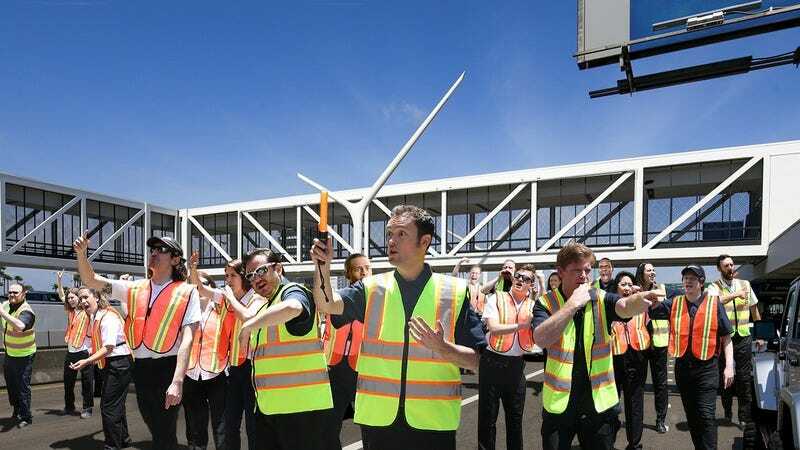 But travelers will be happy to know that one airport is finally stepping up to the plate in a big way: Los Angeles International Airport just announced that it’ll be hiring 500 new workers to yell at people in the pickup lane. Finally, an airport that knows what it’s doing! In a move that should definitely take the headache out of navigating the pickup lane, a small army of workers will soon be on hand to helpfully shout at drivers to keep moving or wave them in a random direction for an unknown reason. Anyone who’s driven to the airport knows how difficult it can be to figure out which pickup lane you need to be in, but soon when you drive to LAX, you will have no shortage of uniformed employees getting mad at you for being in the lane someone else just told you to use. Once this initiative is fully implemented later this year, a typical pickup zone will have no fewer than 25 workers haranguing each driver whose friends and loved ones are still making their way to the car. Wow, way to go, LAX! Here’s hoping more airports start taking a page out of your book.